Maintaining the solar panels is of prime importance as a solar panel containing a lot of dirt will not be able to operate efficiently. Hence it is essential to keep the solar panels free of dirt and dust from getting collected. Dust and the dirt getting collected on top of the solar panel will prevent the sun light from reaching the solar panels. Solar panels have to store the sun light received from the sun without loosing any fraction of the sun light. By properly maintaining the solar panels, the efficiency of the solar panels get increased by 30%. 2) Soft cloth or sponge. 4) Tool for cleaning glasses. First step involved in the cleaning of the solar panels is the manual cleaning of the surface of the solar panel. The location of the solar panel plays an important part in the cleaning of the solar panels. If the solar panels are located at the roof of the facility, then there should be some provision for the person to reach the roof of the facility. The person should have a secure provision at the roof so that the cleaning of the solar panel surface can be performed safely. If there is no place for the person to secure, then the person may fall from the roof and get injured. 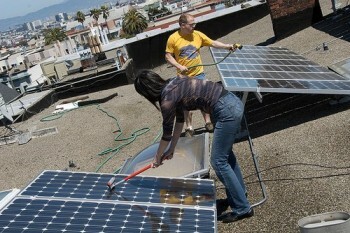 After the person gets a secure point near the solar panel, the cleaning of the solar panel commences. First the solar glass surface is dipped in water and the cleaning solution to a considerable amount of time. The water and the cleaning liquid combination won’t affect any part using the solar panels, as the glass surface of the solar panels safely insulate the underlying electrical connections from getting wet. After allowing sufficient time for the liquid solution to remove the dirt and the dust from the solar panel surface, the sponge is used to clean the liquid from the solar panel glass surface. The sponge will remove the liquid along with the dirt from the surface. The person should take sufficient care to ensure that only the required force is applied to remove the dirt and the dust that has collected on top of the surface. When the person applies more force, there are chances of damaging the surface. Other than this cleaning solution, one can also opt for an environment friendly solution. But the environment friendly solution should be capable of removing the dirt and the dust collected on top of the solar panels. One could also try to test the solution on a plain glass surface before using on the solar panels. While cleaning the dirt and the dust that have collected on the solar panels, the cleaning person should also remove other debris such as the wooden sticks, leaves and flowers from the neighboring trees. One should also find for these debris in between the solar panels and also on top of the solar panels. It is always ideal to plan for a periodic cleaning of the solar panels, so that solar plant functions properly and none of the sun light gets lost. In addition to the manual cleaning, there are automatic solar panel cleaning systems that are available in the industry. These automatic cleaning systems can be used if the solar panels are extremely difficult for the person to reach and clean it manually. These automatic systems are very much similar to the automatic car window wiping systems. This also contains the spray hose and the wiper to clean the solar panels by removing the dust and the dirt that has collected. There is also a way in which the cleaning of the solar panels happens naturally. In this way, the solar panels are installed at a particular angle relative to the horizontal surface. As the solar panel is tilted, the rain that falls on these panels, washes away any dirt that are present on the panels.